In this week’s Said & Dunn post we are excited to highlight a piece from Kim Meninger, MBA. Kim is a career, executive, and leadership development coach, with a particular focus in supporting women in predominantly male industries. I had the opportunity to attend a recent talk of Kim’s entitled “Using Self-Promotion to Advance Your Career” as part of the Women’s Accelerator Initiative at the Broad Institute, an affiliate of the Dunn Lab. Self-promotion is critical to career success. Yet many people, especially women, feel uncomfortable engaging in the process, often reporting that self-promotion feels inauthentic or gives the impression of simply bragging. However, during her talk, Kim explained that self-promotion is “not self-serving, but instead is a service to others.” When we self-promote in the workplace, we allow others to leverage our work and share our expertise. It is a missed opportunity for everyone if colleagues, collaborators, clients, or superiors don’t know what you do or what you are currently working on. This blog is a repost from Kim’s website, Executive Career Success, and nicely recaps some of the big points she mentioned during her Broad Institute talk, particularly the notion that your work isn’t going to speak for itself. This post is adapted from its original post on Kim’s blog. You can check out the original post here. Many of my executive coaching clients lament the notion that their work doesn’t speak for itself. Given the choice, they would much prefer to focus on performing high quality work than engaging in self-promotion tactics that feel unnatural or obnoxious. And rightfully so. Nobody respects someone who shamelessly toots their own horn. But, what if your work really could speak for itself? For many professionals, the reason their work doesn’t speak for itself is because of their tendency to keep their heads down and quietly perform their roles. They do great work but, because they fly under the radar, they remain a well-kept secret. Your work can speak for itself, if you have enough overall visibility. 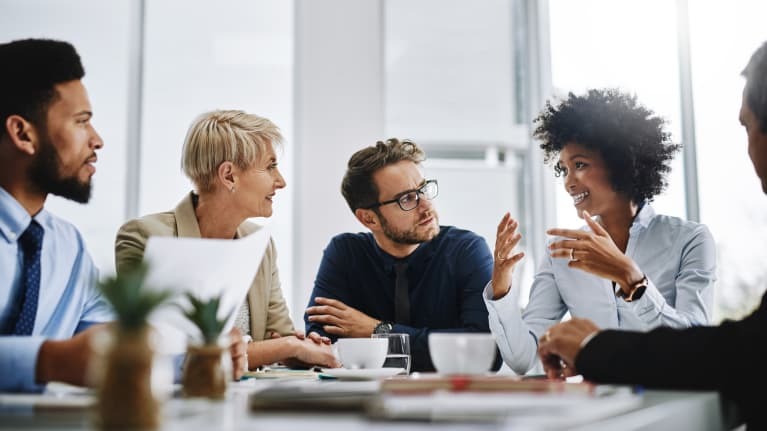 When you’re well connected to others throughout the organization, you don’t have to promote your value in inauthentic or unnatural ways. Others can see it first-hand. How do you raise your visibility? It’s tempting to use lunch and other breaks to catch up on work or take care of personal business. Those who identify as achievers often scoff at those who socialize in the office, preferring to focus on what they perceive to be most productive. While socializing can certainly go too far, those who prioritize getting to know others and investing in personal connections have far greater visibility than those who bury their heads in their work. Personal interactions create organic opportunities to share updates on your work, highlight success stories and offer to help others. These moments differentiate you from your peers, making you much more memorable when decisions are made about who to tap for new opportunities. Technology has made us all more efficient communicators but efficiency isn’t always the primary goal. The greatest opportunity for visibility and advancement stems from strategic relationships. Efficient communication doesn’t build trust and demonstrate value as effectively as relationship building. Rather than rely on email to communicate your ideas or ask questions, walk over to someone’s desk and start an impromptu conversation. Or, request some time to sit down and better understand someone’s role and goals. If you can’t meet with them face-to-face, use video conferencing or, even the phone, to create a more personal connection. These conversations reveal so much more about people’s cares and challenges than email ever can. And, in these moments, you have a meaningful opportunity to show your value. I recognize that time is a limiting factor for all of us. We barely have enough time to do our own work, let alone proactively seek out opportunities to help others with their work. But one of the greatest ways that you can demonstrate value is to leverage your expertise in support of those around you. If you have a unique skill or natural strength, and you lend that strength to others, people notice and appreciate your help. You not only benefit from the goodwill but from the additional visibility and recognition. You can help others in many ways. A few examples include: offering to mentor junior members of your team, sharing best practices cross-functionally, teaching others about an area in which you have expertise, etc. Your efforts don’t need to be time-consuming to be meaningful. Most importantly, they should reflect your unique value (I’m not talking about office housekeeping). When you step away from your desk, invest in personal relationships and demonstrate a willingness to share your expertise with others, you gain far greater visibility and respect than inauthentic self-promotion efforts can ever bring you. Try to be actively engaged in conversation during meetings instead of multitasking on your computer. It’s a missed opportunity if you are not truly present. Take a real lunch break with colleagues away from your desk. Building strategic relationships will open many doors of opportunity, whether it be sharing a new perspective, exchanging resource ideas, receiving feedback or forging new connections. Use these self-promotion techniques so they become a natural part of how you operate. Be true to yourself, find strategies that feel authentic to you, and then incorporate them into your daily routine.